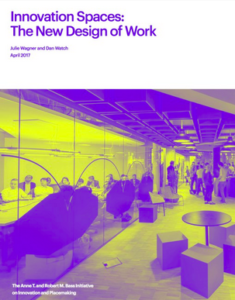 By Julie Wagner and Dan Watch, new research from the Anne T. and Robert M. Bass Initiative on Innovation and Placemaking shows how workplace design stimulates the creativity and competitiveness of workers and firms. Innovation spaces—buildings and interiors used in the innovation economy ranging from incubators to research institutes to innovation centers and start-up spaces—are growing significantly in cities and suburbs across the globe. In both the United States and Europe, for example, accelerators and incubators have more than doubled since the financial crisis. A new trend paper from the Brookings Institution’s Anne T. and Robert M. Bass Initiative on Innovation and Placemaking, called “Innovation spaces: The new design of work”, finds that not only are these spaces proliferating, they are also changing to reflect the evolving collaborative, cross-sector, and high-tech nature of innovation. Employers, economic development professionals, city leaders, and, ultimately, designers should recognize the importance of innovation spaces and intentionally design them into functional catalysts for innovation, and not simply "cool" spaces. Those spaces designed with people and collaboration in mind not only bring innovative aesthetics, but also contribute to the modern economy and the strength of the communities in which they reside. * The Anne T. and Robert M. Bass Initiative on Innovation and Placemaking is a collaboration between Project for Public Spaces and the Brookings Institution. It aims to catalyze a new cross-disciplinary approach to city building that integrates the reinforcing benefits of vibrant public spaces, innovative urban economies, and inclusive growth.